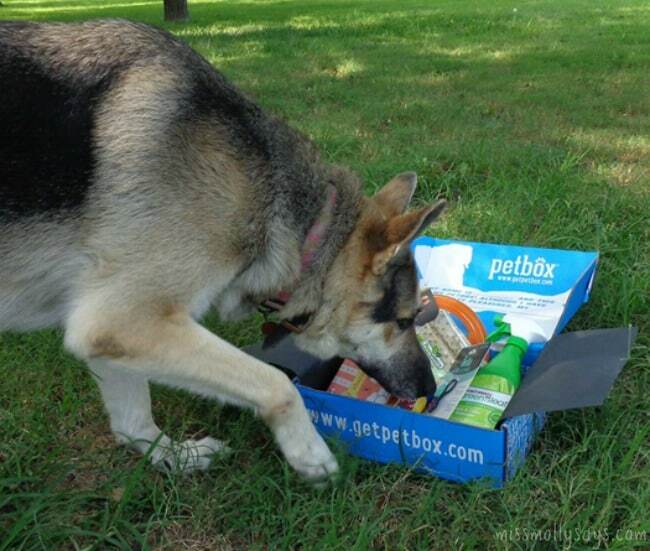 July’s PetBox Brought Us Fun and Yummy Goodies! We got our July PetBox in a couple of weeks ago! It’s always an excitin’ day when we see that big brown truck roll up with our box! We love surprises and the PetBox is like a big ole mystery box filled with all kinds of goodies! There’s always somethin’ in there we each like! PetBox comes every month from a subscription service that my Lady got us. We get a box each month full of surprises! We get to try out treats, toys, pet supplies and more! We sure feel special and spoiled! For a bunch of rescued pups, we sure are livin’ the high life now! This time when our box came, we were all outside for playtime. We were so excited that my Lady let us open it up right out there in the yard! Sallie got right on up in there to check it all out first. She had her nose all down in that box! Maggie rooted Sallie out so she could check it out herself. She spotted something in a bottle that she was mighty interested in! By then, it was a free-for-all! I showed up, along with Brandi and Ozzy and we all had our head in the box. Brandi laid eyes on frisbee lookin’ thing right off! Brandi sure loves toys! My Lady called a halt to our nosin’ sayin’ she needed to take some pics ‘fore we could tear into things. She said we’d get to try it out in a little bit. So, I’ll let her do the s’plainin’ of all the goodies in our July PetBox. Here’s my Lady to tell ya about our July Petbox Goodies! We have talked before about PetBox and how much we love it. PetBox is a monthly delivery service that introduces their members to fun and healthy new pet products every month! We like being surprised each month, so we let them choose our products. It’s kind of exciting to get a mystery box each month! But, members can pack their own PetBox each month also by choosing products that make the most sense for their furry friends. Another thing I really LOVE and appreciate, is that PetBox gives back! For every box that is shipped out, PetBox feeds a rescue animal. As you know, rescues and shelter animals are very dear to my heart. Well, PetBox also partners with a variety of shelters and rescue programs to help care for neglected animals throughout the country. With all that said, let’s see what the month of July brought us in our PetBox! I’ll tell you a little about each of the products and what the furbabies thought about them. 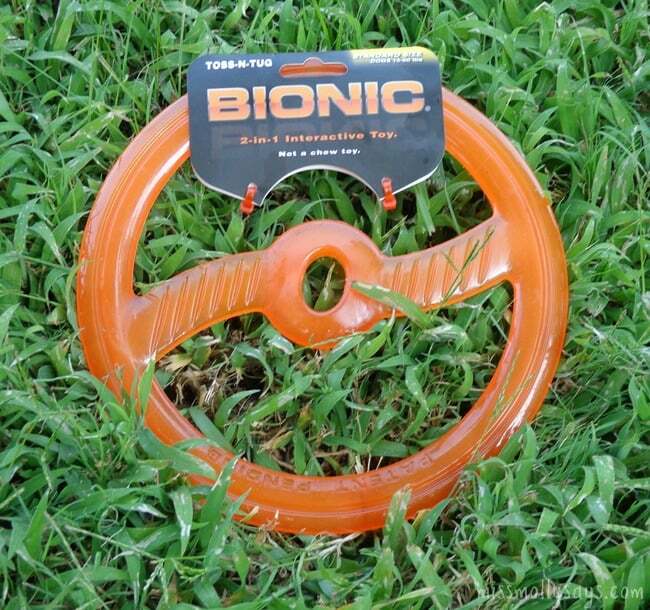 The Bionic Tug-n-Toss that Brandi was eyeing is a really neat interactive toy! You can fly it like a frisbee or ‘flip’ it inside-out and it becomes a tug toy! The Tug-n-Toss also floats in water, so is suited for water play. All the pups loved chasing and playing tug with the Tug-n-Toss. They had a ball with it! I was just saying before the PetBox arrived that I wanted to try these! They must have read my mind! They sent us a 40 ct. package of PawGanics Deep Cleansing Grooming Wipes. 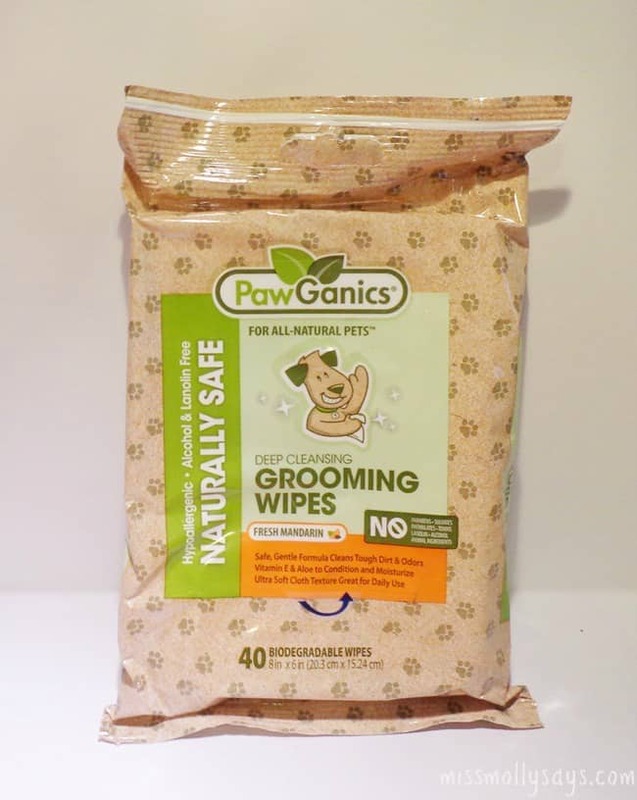 PawGanics have a safe, gentle formula that cleans tough dirt and odors, and conditions and moisturizes your pet’s coat and skin with Vitamin E and aloe. I like that the grooming wipes are hypoallergenic and doesn’t contain parabens, sulfates, phthalates, toxins, lanolin, alcohol or animal ingredients. They are biodegradable and made in the USA. These are great for quick cleanups and freshening them up after heavy play! 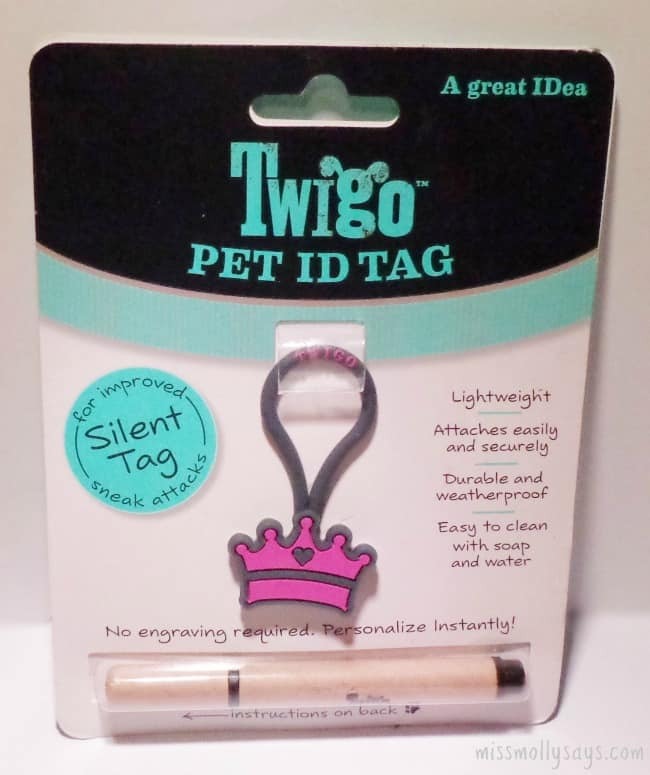 We also received a Twigo Silent Pet ID Tag. These tags are made from a durable, lightweight material that can withstand the elements of mud, rain and moving water. It’s also easy to attach. There’s no need for engraving, just use the special pen with it. Since it was a crown and purple we thought this had Little Bit’s name wrote all over it! She is our little chihuahua and the princess of the group! They even sent along a little something for Mom! It seems I am the designated cleaner-upper of the group! 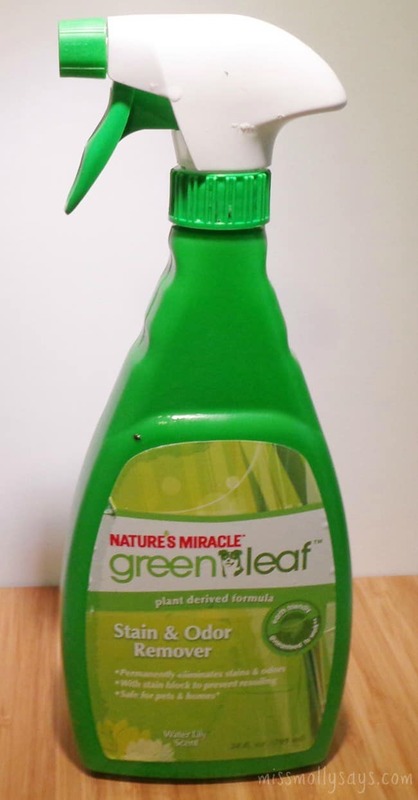 Nature’s Miracle Green Leaf Stain & Odor Remover is a plant derived formula, making it safe for pets and homes. The stain remover permanently eliminates stains and odors with its stain block to prevent resoiling. It also has a fresh light scent. With 7 dogs here, you can only imagine the mishaps we have. So, I was really thankful! 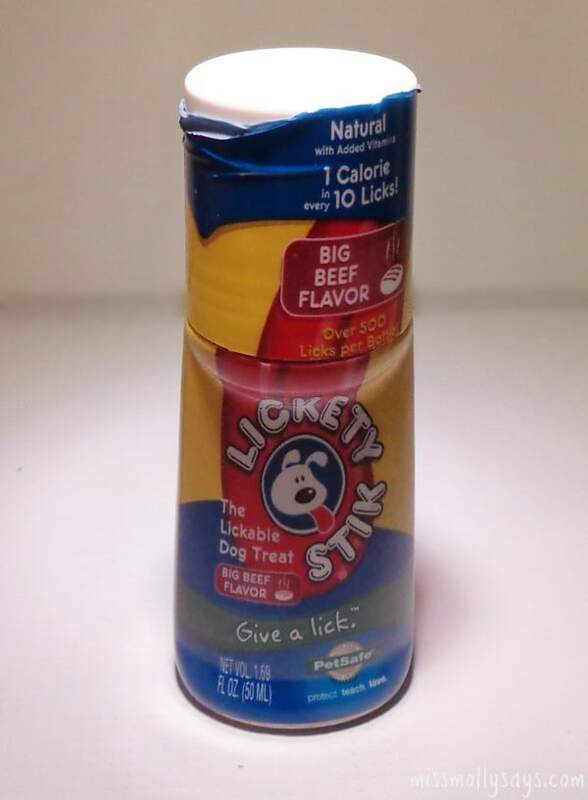 The PetSafe Lickety Stik is what Maggie was after in the box! I guess that German Shepherd nose could tell it was something good before it was even opened, even though Maggie tries to open it! Lickety Stiks are great as a training aid and the beef is one of their favorite flavors! 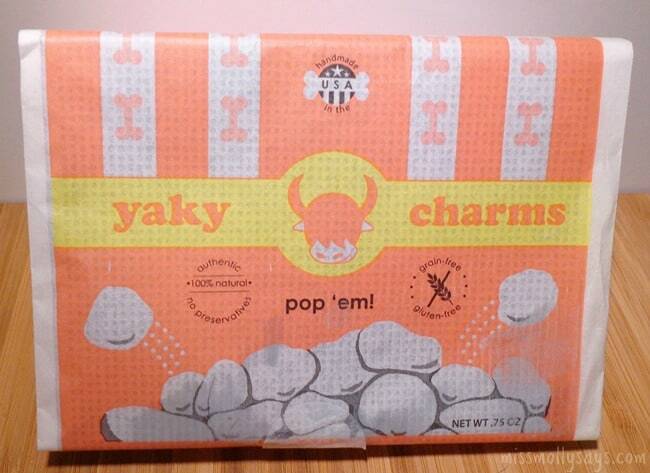 I had never heard of Yacky Charms before, but they are like popcorn for dogs! 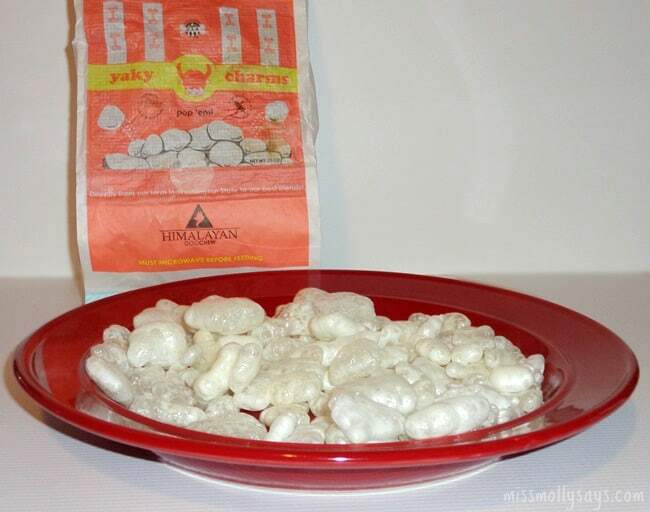 Yacky Charms are made by converting milk into a hard cheese. It’s a fun treat that is 100% natural without any preservatives nor additives. They are also grain-free, gluten-free and handmade in the USA. To make them, you just pop the bag into the microwave like you would microwave popcorn. Let it pop and you have instant treats. We popped up the Yaky Charms and everyone enjoyed them! We sure got a load of great goodies this month, both for the pups and Mom! I’m not sure who loves the PetBox more, me or the pups! 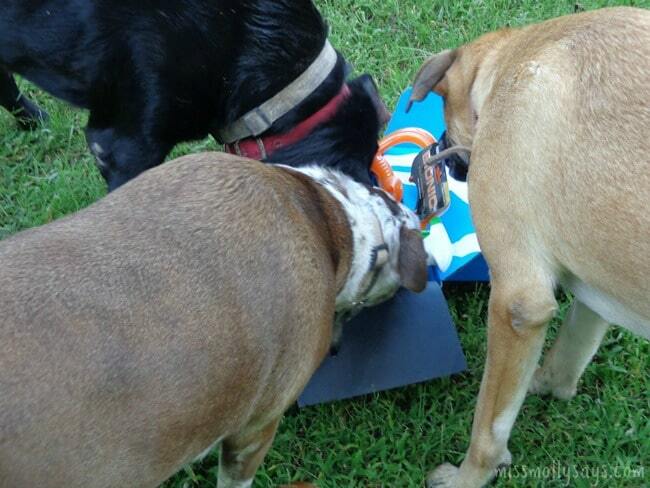 I love trying new products and it’s no secret, the pups love their taste-testing toy-testing job! They really look forward to their monthly PetBox! Once again PetBox did us right on the goodies it was filled with! The value of the products is well over subscription cost! Very impressive indeed! Be sure and check out our other PetBox Reviews for fun pictures and info on new items! How does PetBox Subscription Service work? 1) Tell them about your pet: Answer a few questions about your dog or cat and they will create a personalized list of products. 2) Pick your plan: Members get $50 of value in each PetBox for as low as $29/month. And shipping is always free within the United States. 3) Pack your PetBox: Each month, choose the items you want in your PetBox, or ask us for a surprise selection of our favorites. Purchase your pet a subscription! If you think your pet would love a PetBox, go here to get started. But wait! We have a special discount code for Miss Molly Says readers! You can save 10% by using discount code MISSMOLLY. 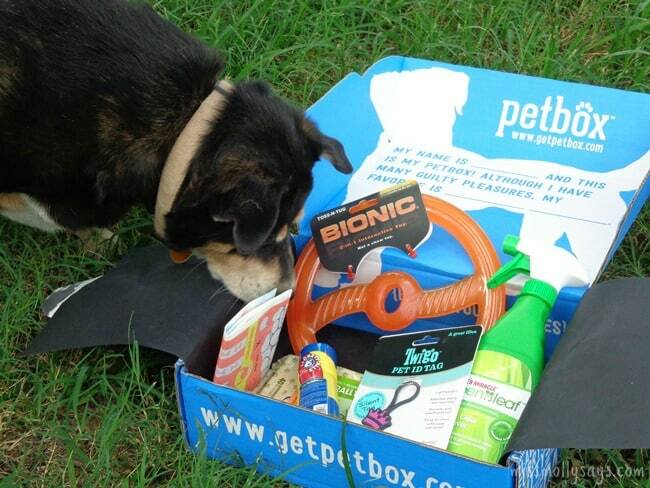 You can also subscribe to several months of PetBox and each month they will automatically arrive. Don’t miss any of the latest news from PetBox! Stay up to date by fanning them on Facebook and follow them on Twitter and Pinterest! I was provided with the product above from PetBox. No other compensation was received. All thoughts and opinions stated here are 100% my own. I’ve had my eye on the bionic toys for a while- and the dogs would love to try the yaky charms! 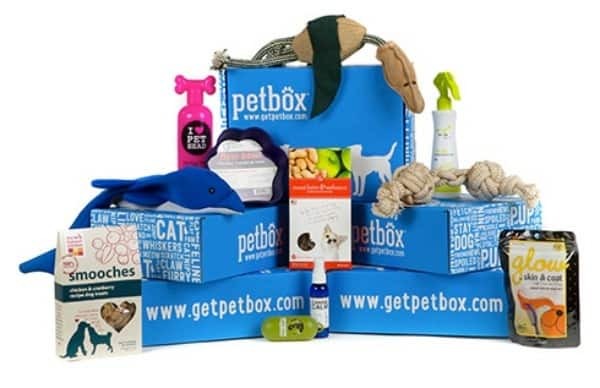 What a nice selection and Petbox is a great subscription box.